Bailey was on pace for a complete game shut-out if the other guy hadn’t been just as good. Oh, the rain was a problem, too. Technically, last night’s game still isn’t over, so does it qualify as the “last game”? 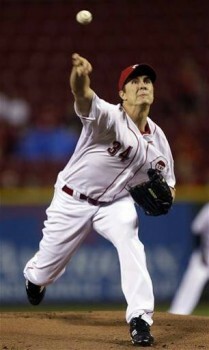 Homer Bailey was just spectacular last night before the rain stopped the 0-0 game after the top of the ninth inning. He struck out 10 in his 8.0 innings of work and Aroldis Chapman put the team over the 11-K limit needed to get attendees a free pizza. Assuming they’re still doing that promotion this season. The game will be continued at 5:30 p.m. today. If you had tickets to last night’s game, you can exchange them for tickets to tonight’s game and see both the continuation and tonight’s game. If you had tickets to tonight’s game, you can also see both the continuation and tonight’s game. The Reds go for the sweep or the series win tonight against Philadelphia at 7:10 p.m. Mike Leake (RHP, 0-0, 6.75 ERA) tries for his first win of the season against John Lannan (LHP, 0-0, 2.77 ERA). That’s not to say he won’t pick it up. I’m thinking it’s just a matter of time. Dude’s a great hitter. But the notion that how he’s hitting now is somehow terrific just misses the mark, and badly. If he were being paid $17 mil to get on base and score runs, fine. He’s not. Except for the people who regard walks as basepath cholesterol, I think we all can agree that walks are a universe better than outs and somewhat less thrilling than hits. But Votto’s not swinging in a vacuum. Someone else is deciding where the pitch is going. If the ball isn’t anywhere close, he can’t hit it. So stop acting like 21 walks are all his damn fault or that they mean he’s in a damn slump because the damn pitchers are damn nibbling. Yes, if you had tickets to tonight’s game you can go to the continuation of last night’s game at 5:30. I already said that. Stop asking about it in the comments of all the Reds’ news stories and Facebook posts.